(Bloomberg) -- Oil fell the most in three weeks as disappointing economic data sowed new fears of slowing global growth. West Texas Intermediate futures in New York dropped 1.6 percent Friday, paring the week’s gain to less than 1 percent. Weaker than expected manufacturing data from Germany and France cast fresh doubts on Europe’s economic outlook, dragging equities down. The U.S. treasury yield curve inverted Friday morning for the first time since the financial crisis in 2007, a move widely seen as a reliable harbinger of recession in the U.S.
Oil has gained about 30 percent this year, and a two week rally saw prices climb above $60 a barrel in New York on Wednesday for the first time in 2019. Prices have been supported by OPEC and its allies reaffirming their commitment to supply cutbacks and ongoing disruptions in Venezuela and Iran have also squeezed supplies. But the concerns over slowing global growth and the ongoing U.S.-China trade dispute have also capped rallies. WTI for May delivery lost 94 cents to settle at $59.04 a barrel on the New York Mercantile Exchange. Brent for May settlement fell 83 cents to settle at $67.03 a barrel on the London-based ICE Futures Europe exchange. The S&P 500 index was down 1.8 percent as of 3:45 p.m. in New York, on pace for its worst single-day since January 3. 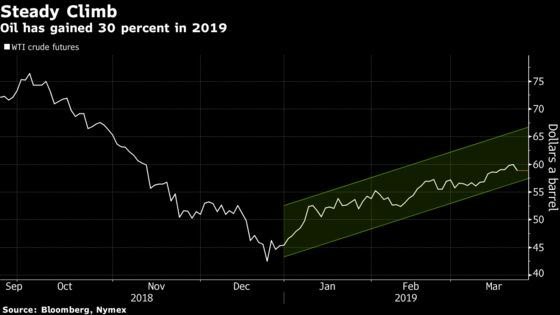 Shale explorers brought the number of oil rigs operating in the U.S. to their lowest level in about a year as they stick to pledges to rein in spending. Brazilian state-controlled oil giant Petrobras has hedged part of its oil production for a second successive year, fixing the price for part of its 2019 output at $60 a barrel to protect its cash flow.